Dr. Jagsi: We surveyed women diagnosed with breast cancer and found that many women were concerned about the genetic risk of developing other cancers themselves or of a loved one developing cancer. Overall, 35 percent of the women we studied expressed a strong desire for genetic testing, but 43 percent of those did not have a relevant discussion with a health care professional. In addition, minority patients with a strong desire for testing were less likely to discuss it with a professional, even though studies show that minority patients are not at lower risk for these mutations. 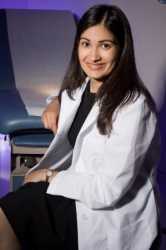 Dr. Jagsi: Women who had a strong desire for testing but had not discussed this with providers were more likely to report worry about their own risks when evaluated in long-term follow-up as survivors. It is important to note that only about 5%-10% of breast cancer patients have an inherited genetic mutation that drives their cancer, and many of the women who reported interest in genetic testing were at low risk of having a mutation. As providers, we need to recognize that even women who don’t seem to us to have a high risk or need for testing might still be interested in discussing those issues. There is a lot of media interest in genetic testing, with recent high-profile court cases and celebrity experiences. Even patients at low risk for harboring a genetic mutation can still benefit from hearing their doctors explain why we don’t think they need testing. By more routinely addressing genetic risk with patients, we can better inform them of their true risk of cancer returning or of developing a new cancer. This could potentially alleviate worry and reduce confusion about cancer risk. Dr. Jagsi: Our study was conducted several years ago. In recent years, given growing media attention and direct-to-consumer marketing of genetic tests, there may be even greater interest in these issues; there are also a broader array of testing options available to patients today. Future research should seek to explore the experiences of women diagnosed more recently. This entry was posted in Author Interviews, Breast Cancer, Genetic Research, Journal Clinical Oncology, University of Michigan and tagged breast cancer, genetic testing by Marie Benz MD FAAD. Bookmark the permalink.